It was our first trip to Fiji and I first checked into staying on Namotu or Tavarua. Namotu does not allow kids on the Island (unless you book the whole resort), so that was not an option for us and Tavarua quoted us around $3300 per person for a one week stay. Both these islands are amazing and probably well worth the price if you can afford it but it was way over our travel budget for the three of us. My friend Scott recommended checking the Plantation Island Resort as a less expensive and family friendly option. We booked a “bure” there and got a meal plan, they had some good specials, including free meals and boat transfers for kids and 7 nights for the price of 5, which ended up a great choice for us and was quite affordable while the good surf spots were still easily accessible by boat. We flew into Nadi on Fiji Airways and took a boat, the Malolo Cat, to the Plantation Island Resort from Denerau Port. on Malolo Island we rented beach cruisers with Bula Bikes and explored the beautiful island by bike. We also took several boat trips to go snorkeling and island hopping to some of the other beautiful places in the island chain. The resort had a cool “waterpark” and had lots of fun activities for kids, our son loved it. They also had a “kids club” where you could drop off the kids so the parents could have some alone time. It was stormy and rainy the first two afternoons but then the weather cleared and was fantastic for the rest of the trip. Overall a great, memorable experience and we hope to go back soon. We went on a few surfing expeditions by boat around Namotu and Tavarua Island. The surf spots featured in the videos are Swimming Pools, Wilkes, Restaurants, and Cloudbreak. 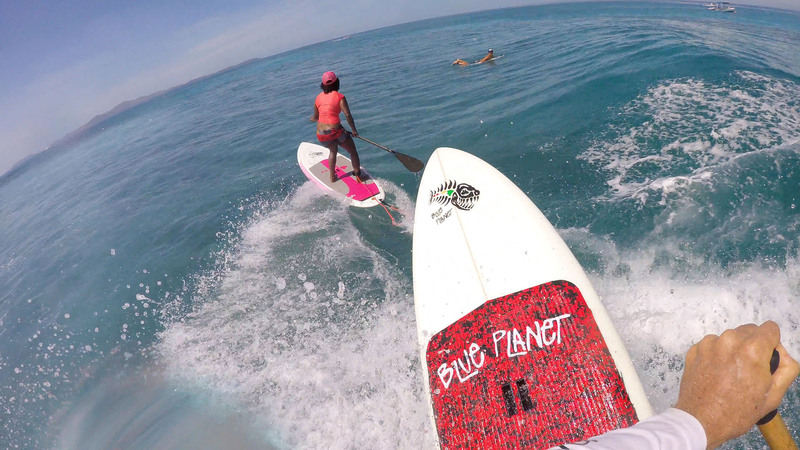 I posted three videos of this trip on the blueplanetsurf youtube channel and they contain some of the same footage. The first one is a short SUP surfing teaser, the second a longer SUP surfing video, the third and longest video starts with footage of the resort and some of our snorkeling and boat trip adventures and ends with the SUP surfing footage. All video footage was shot with a DJI Phantom4 drone and GoPro Session5 camera, I hope you enjoy it.